Just days after the Food and Drug Administration announced a ban on wooden boards for ageing cheese, they've completely reversed their stance. "Wood is a living thing, and cheese is a living thing, and when you combine them it creates a microbiological environment for the cheese. It imparts a flavor, and creates an environment for a healthy rind to grow on the cheese. Basically, it's a catalyst for beneficial bacteria to grow on the outside of that cheese to essentially prevent the bad mold and allow the good mold to grow. Thirdly is the humidity factor — the boards are acclimated to a certain humidity. 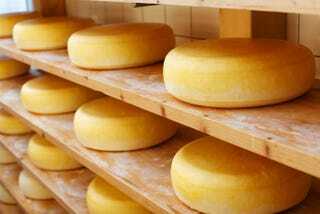 The wood holds its own humidity and slows out the drying of the cheese." Really, you'd think if wooden boards were really THAT unsanitary, we would've figured it out before now since we've had millenia of practice making cheese. This isn't the first time the FDA has jumped to conclusions, nor is it the most insane (that honor probably goes to the time the FDA tried to claim walnuts and cherries were drugs while still allowing Frito-Lay to market its chips as "heart healthy"), but it's still a hell of a head-scratcher. It seems like most non-Kraft singles forms of cheese (hahaha, we're calling Kraft singles "cheese") at least benefit from wooden-board aging, and as Thrillist notes, some even require it. Given that, it's good to see that the FDA has listened to reason with what, for a government agency, is shocking speed. Rest easy, cheese-lovers: your wheels are safe. For now.